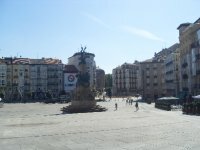 Vitoria is the capital of the province of Álava and the Basque Country in northern Spain. With a population of around 235,000 people, it is the second largest Basque city, after Bilbao. The city has an ancient town center where most of the streets still have the medieval name of the jobs that was used to be in each one of the streets (Herrería, Zapatería etc). In the Town Center you can find the Cathedral of Santa María, that is one of the most important attractions of Vitoria-Gasteiz. Guided visits can be made, and it's recommended to make the reservation via Cathedral Santa María web page. Vitoria-Gasteiz has a small Airport (Aeropuerto de Foronda; VIT) 8 kilometres north of the town with a few flight destinations. There is a shuttle bus (company bidasoa) to the airport from the centre (catedral) and outside the bus station and back suitable for the Ryanair flights to Bergamo. You can ask at the tourist info for exact schedule and location. Bilbao Airport offers more connections and is 70 kilometres away. You can visit Vitoria-Gasteiz coming from Bilbao Airport (Loiu) on a toll road or using public transport (Autobuses La Unión). The coach station is located north-west of the center at Euskaltzaindia Plaza with connections to all major Spanish cities including Bilbao, Burgos, Santander, Zaragoza, Pamplona and Madrid. There is a left-luggage facility at the Coach Station (to the east of the city centre). Cost is roughly €1 per bag per day, and you can leave luggage for several days. Buses might be of use for people staying further away from the town centre. Vitoria-Gasteiz itself is a very small city. Virtually everything you will want to see is reachable on foot. There are several options for free bicycle usage throughout the city. Traditionally you can have a few small drinks in the bars around the town center and enjoy this with some tapas. Usually every bar has one speciality and it is interesting to taste them and then you go to another bar. The boiling point for bar visits is at 2:00pm just before lunch time. The Basque cuisine is one of the best in Spain and Vitoria has restaurants in all categories. Like in other cities of the Basque Country nigthlife is centered around the old medieval zone of the city or 'Casco Viejo' where there a bar every few meters. Same style bars usually (but now always) tend to be around the same area. We have a comprehensive list of accommodation in Vitoria searchable right here on Travellerspoint. You can use our map to quickly compare budget, mid-range or top of the range accommodation in Vitoria and areas nearby. This is version 7. Last edited at 3:44 on Aug 2, 17 by sleepBot. 3 articles link to this page.